How crazy is this? Two FO posts in a row?? Have I gone mad?? Ummm...maybe. But when I tell you that this project is also made from a Veera Välimäki pattern and knit in SweetGeorgia Yarns just like the last FO, you'll definitely think I've gone bonkers. Meh, what can I say? I'm nothing if not consistent and somewhat predictable in my knitterly ways. I had previously mentioned that I had cast on Veera Välimäki's Folded back in May when I needed something small and mindless to bring with me to Vancouver for the Dyeing to Get Some Colour workshop. I was knitting on it here and there, and when I needed a break from Buckwheat. It wasn't until I had finished Buckwheat that I was able to give Folded my undivided attention. 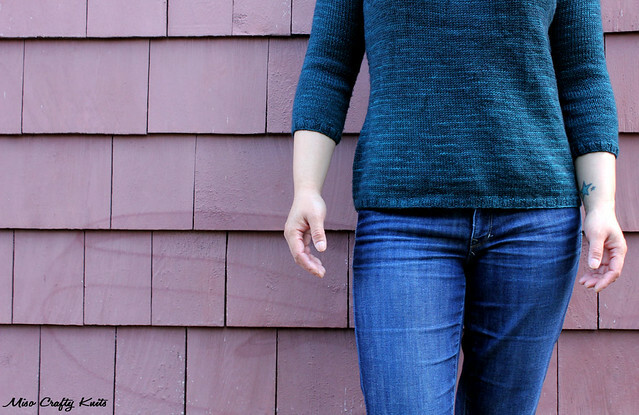 Considering that I was picking away at it between other projects, I'm still pretty darn impressed with myself that I managed to knit this pullover up within a month. More impressive still - it fits!! Yay for knitterly instincts and double yay that my plan of not knitting a gauge swatch beforehand didn't backfire on me!! I'm all über smiley faced about that! Even though this pullover fits well and like it's suppose to, I think I could've gone down a size smaller still. I don't know...maybe it's because most of the pullovers and cardigans that I've knit so far are form fitting with negative to no ease and that I'm used to knitting that kind of garment. So to try on, to see, and to feel this project be a little on the looser side made me feel a little...off. Does that sound weird? Does that make any sense to any one else? Don't get me wrong, this pullover is sooo comfy. I've worn it a few times now (a plus for the cool West Coast weather?) and each time I have a hard time taking it off. Yes, it's just THAT comfortable! As for the knitting side of things, well, what can I say? Straight up easy peasy. For some people all that stockinette in the round might be extremely boring. But I found that it was perfect for travelling, watching TV, socializing at knit night, listening to audiobooks (trust me, trying to knit anything other than stockinette while listening to The Game of Thrones, just isn't do-able! ), and most of all, perfect for those space cadet mornings when you are so beyond tired that you just sit at the kitchen table staring at nothing in particular while automatically bringing your coffee cup to your mouth all while your kiddo is calling out "MOM! MOM! MOOOOOM!!!" non-stop and your husband keeps going on and on about boring work politics. Perfect, I tell you. And who doesn't like having simple stockinette on the needles to turn to from time to time when they're also working on something complicated? Don't let those darling pleats on the chest scare you either. They might sound and look crazy hard to do, but they're not. They're a little fiddly but they're actually pretty darn fun to do. I did find that using DPNs a few sizes smaller to hold the sets of stitches really helped and didn't make the knitting feel overly tight as you try to manipulate the fabric. Now, while 99.9% of this pattern consists of mindless knitting, the pleats will be the only thing where you'll actually have to concentrate. Or at least, it was for me. Who knows, I could have been brain dead the day I did the pleats, but I did have to give them my undivided attention to make sure I had them going in the right direction (of course I took an Instagram photo!). 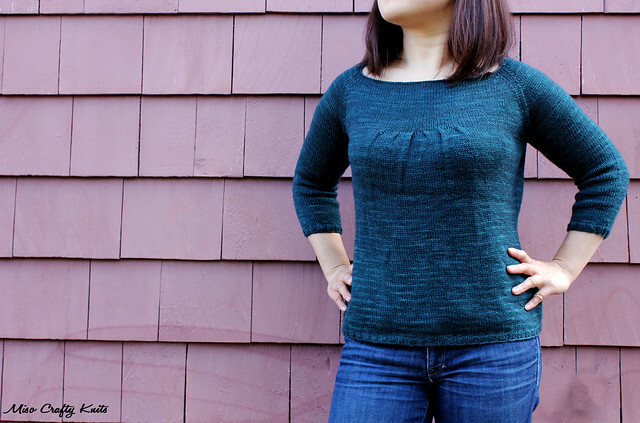 I had knit my pullover according to the pattern with the only mod being that I shortened the lengths of the body and sleeves. I did have to fudge the last row of short rows at the back neck because the pattern doesn't really explain clearly how you're suppose to pick up those last extra stitches. I don't think you can tell and I really don't think it makes a difference if an extra row was knit since the neck is pretty open and wide. Actually, if I were to knit this again (and yes, this pattern is going right back into the queue!) I would close up the neck a little more. The way it is now looks nice and flattering but what you don't see is how my bra straps will start to show. If you move the straps so that they don't show, they just end up sliding down and off my shoulders. A bit annoying, for sure, but nothing that a tank top underneath can't fix! I think I would also try knitting the smallest size for the body and maybe omit the waist shaping. Or maybe space out the shaping more than what the pattern calls for. As you can see in the photo above I've got "hip flaps" happening. This also happened on my Hooray Cardigan. Note to self: the next time you knit a Veera Välimäki pattern remember to watch out for possible hip flap action! Hey, have I ever told you just how much I love SweetGeorgia Yarns' Riptide colourway?? I seriously want a cardigan, a jacket, everything...all made in this colour. I love it to the point of obsession. The pullover did bleed a little on my fingers during knitting and a little in the water while it soaked, but I remember Felicia saying that Riptide was one of the most saturated colourways in the SweetGeorgia line up. I also remembered from both my own experience and from hearing other dyers say it, but blues sometimes don't completely exhaust during the dye process and usually tends to bleed anyways because of the excess dye. I had a hard time trying to capture this colourway because my photos kept coming out too dark and couldn't pick up the lighter cyan bits (that caused me glee every time I got to knit that bit). I definitely plan on knitting this pattern again. I know I say that about every pattern I've knit thus far, and really, other than socks and accessories, have you seen me knit a pattern twice? 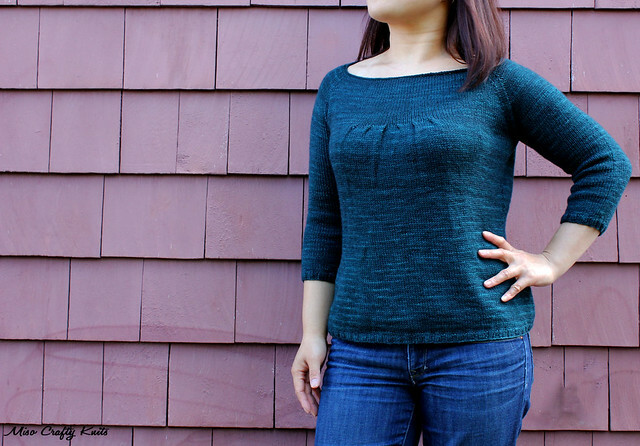 There's just so many other awesome patterns in my queue that I want to knit up that sometimes knitting a pattern that I had just knit doesn't seem as exciting as one that I have yet to knit. But this time, this time is different. 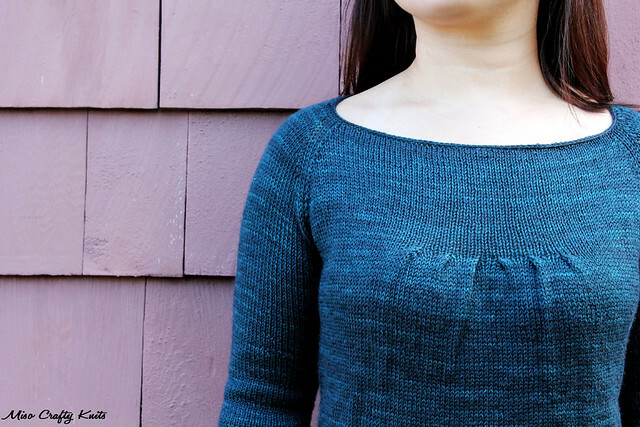 Aside from Buckwheat, the garments that I knit are generally cardigans. Sometimes (ok, a lot of the time) I feel lazy and don't want to go on a hunt for a clean shirt/tank top to wear under a cardigan. Sometimes I just want to throw on a top and not worry about it. Not to say that Moms can't be fashionable or anything, but since becoming a Mom I've become a jeans and t-shirt or jeans and a tank with a cardigan on top kind of girl. Dresses and skirts just aren't in the cards for me right now, since I get overly paranoid about having to bend over, carry, or chase the Munchkin and exposing my girly part to the world. Not to mention that going down a slide in a skirt just isn't fun. I suppose I could wear long skirts and dresses but I'm short in stature (I'm 5 feet and a bit....I highly emphasis the bit part) and find that calf and maxi lengths make me look even more squat. So you see, this pattern is perfect for my wardrobe. It would be so easy to always have this pattern on the needles and since it's knitting to a certain length, there's no row counting or fancy detail to keep track of. I can already envision having a Folded in a fun Kelly green, a deep red (MadTosh's Tart comes to mind! ), a reddy-purple (like Venetian by MadTosh), and I would definitely get a ton of wear if I had a Folded in a smokey grey...Yeah, you can see where this is going! The wheels are turning already...and I'm itching to cast on another one now! But should I? the color looks awesome on you, so just keep on knitting with riptide no matter what anyone says! great job!! Thank you so much Nina! I think you should definitely get some Riptide! It's just too lovely of a colour to pass up. that looks great on you! i LOVE the colour. and i see what you mean about the "hip flaps" - i'll have to make a note to watch the increases when i do mine. Thanks so much Felicia! :) I think everyone should have a little stockinette in the round on the needles at all times! SO SO SO PRETTY! So your hem doesn't roll up, eh? Right now mine is unblocked (obviously, I'm still knitting it) but it's rolling like crazy and I'm contemplating chopping off a few inches from the bottom, then making a folded hem. Thanks Amy! Once I blocked this baby, the hem stopped rolling. I've worn this quite a few times now and it still hasn't rolled up either. Yay! I hope it stops rolling for you! Oh, thanks for the tip! I don't mind the extra work if it means no hip flaps. I think in the future when knitting a Veera pattern I just need to be more mindful of the waist/hip shaping...since I don't really have much shaping in those areas anyways! I think I'm just being nitpicky too! :p Thanks for the vote of confidence though!